If you go to Google and type in the word “paper,” the top result doesn’t have anything to do with traditional pulpy vellum. Instead, it links to the well-known app Paper, which allows you to sketch on your iPad just as you can in a traditional notebook. But that might not be the case for long. Last week Facebook announced a new product that it plans to release on Monday called … wait for it … Paper. The prior used and “well-known app Paper” was created by FiftyThree, Inc., an award-winning mobile application developer. Its PAPER app has won numerous prestigious awards, including Apple’s App of the Year in 2012. But that didn’t stop Facebook from launching a mobile application with an identical name. “it came as a surprise when we learned on January 30th with everyone else that Facebook was announcing an app with the same name—Paper. Not only were we confused but so were our customers (twitter) and press (1,2,3,4). Was this the same Paper? Nope. Had FiftyThree been acquired? Definitely not. Then, what’s going on? Eight days later, on February 11, 2014, King.com Limited, an online and mobile game development company (and coincidentally the largest game developer on Facebook), amended its pleading and asserted a counterclaim in a trademark opposition proceeding over its CANDY CRUSH SAGA mark at the United Stated Patent and Trademark Office (“USPTO”). Just a month earlier, King caused a stir of its own when its trademark application for the mark CANDY was approved by the USPTO. Lost among the ensuing mass of misinformation over the scope of King’s trademark rights to the word CANDY was an ongoing dispute over registration of King’s CANDY CRUSH SAGA trademark. A company named Runsome Apps Inc. had opposed King’s application for CANDY CRUSH SAGA back in April 2013 based on Runsome’s prior used and registered CANDYSWIPE trademark. As the prior user and registrant, Runsome appeared to have a relatively strong position vis-a-vis King. What are the odds of finding a third party using arguably a legally equivalent mark, that’s available for purchase, with purported priority over an opposer? King is now attempting to tack on AIM Productions N.V.’s prior common law use to King’s CANDY CRUSH use, which would – if successful – effectively give King priority over Runsome. Nevertheless, this turn of events was a punch in Runsome’s gut. Runsome had initiated the proceeding against King to address concerns regarding actual consumer confusion over the parties’ respective apps, which had led to inaccurate claims that it — the senior user — was a King knockoff, which in turn led to a downgrade on its app rating and negative reviews and ultimately poor business. Now, Runsome finds itself as the defendant, with its priority to the mark in question and its own trademark rights in limbo. The disputes also illustrate the nuances of trademark infringement analysis. For instance, Facebook’s use of “paper” is in reference to a newspaper while FiftyThree’s connotes a sheet of “paper” for drawing. These subtle differences matter. They shape commercial impressions. As does the history of CANDY-formative marks in the field of gaming. All of which, along with other factors, must be considered when determining the full scope of one’s trademark rights … whether registered with the USPTO or not. In evaluating these issues, it often helps to start by looking at USPTO records. All are pending applications and some face significant hurdles to approval. They are also based on foreign filings with a laundry list of goods and services (always a red flag) so the full extent of their actual use in U.S. commerce is unknown. As for third party CANDY-formative marks for games, software and mobile applications … there are a ton … the same is true of relevant PAPER-formative marks. These are crowded fields. When there is a crowded field of similar third party marks it is difficult for any one party to claim exclusive rights to the shared word … even more so when the co-existing uses are reflected in the federal register. An applicant seeking registration of a single (and now diluted) term that is encompassed in numerous prior third party marks for identical goods/services is nearly always doomed to fail (I hedge “doomed” with “nearly always” because, well, King’s “Candy” application was approved … they have since withdrawn it). FiftyThree only filed for the single word PAPER mark upon learning that Facebook decided to name their new app PAPER (the application filing date, January 30, 2014, is the same date Facebook announced its new app). The PAPER application has not yet been reviewed by an examiner. 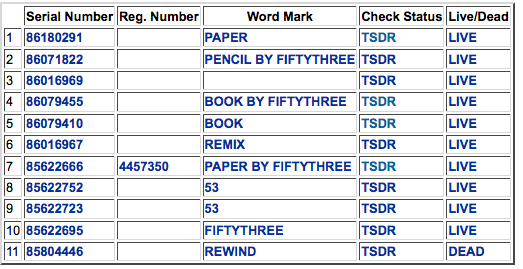 Notice that FiftyThree uses and has pending filings for BOOK … perhaps that did not sit well with Facebook, who have claimed trademark rights to the term BOOK. Facebook has not bothered to file an application for PAPER and probably won’t because FiftyThree’s (and others) rights trump theirs, as far as USPTO filings go … but USPTO registrability only tells half the story. The real world marketplace and actual uses must also be considered … and in this case, the marketplace is digital. Less choices and they all look the same. Obviously, retailers can distribute and feature any products they want. It’s their marketplace. Sometimes they even offer their own store brands and compete with their suppliers or favor certain suppliers and place products where easily found (you know … eye level helps). App stores are no different. I do not know what goes into app store search algorithms but do a search and you’ll find some odd placements (e.g. why is “Cut the Rope” a top 6 result in iTunes when I search “candy”?). The various app stores have mechanisms in place to report content violations. They typically try to allow the parties to work out the issues themselves before taking the drastic step of removing an app from the digital marketplace. There have been reports of apps being removed on potentially overreaching trademark claims. Many app developers don’t have the resources to fight back … the threat of a legal dispute, regardless of the merits, may be enough to either give up or change the name. Squatters and ripoffs have to be stopped … but app retailers must be careful not to wield their power arbitrarily and make self-serving decisions at the expense of consumers and good faith app developers. There aren’t many app store alternatives and on mobile it’s tied to your phone. Sometimes, like with crowded fields, it’s a tough call. But there is no way, under these circumstances, that app stores will remove the Facebook and King apps discussed above without a court order. And that’s a business decision. Perhaps app store consumers are sophisticated enough anyway to navigate the search engines, read reviews and developer details and not be confused as to source. And maybe more weight should be placed on the function or purpose of the app rather than it just being a “mobile application.” After all, not every product available in a traditional retail store is considered a “related good” (for purposes of a trademark infringement analysis). App developers can only hope that digital marketplace operators sift out the frivolous claims and are fair arbiters of consumer confusion (and not create any confusion themselves). Or, they could just avoid the crowd and market an app under a distinctive name … one that won’t just stand out at the USPTO but in app stores as well. → “It’s Gone Forever”: Was the FLAPPY BIRD Trademark Abandoned?